THE GAME set-off at a furious pace with Jonathan Davies, twice, make telling incursions behind the Springbok defence but after South Africa scored their first try, against the run of play, through a brilliant Jean de Villiers score – with Bryan Habana and Bismarck du Plessis to the fore – the balance swung back in the Springboks’ direction. 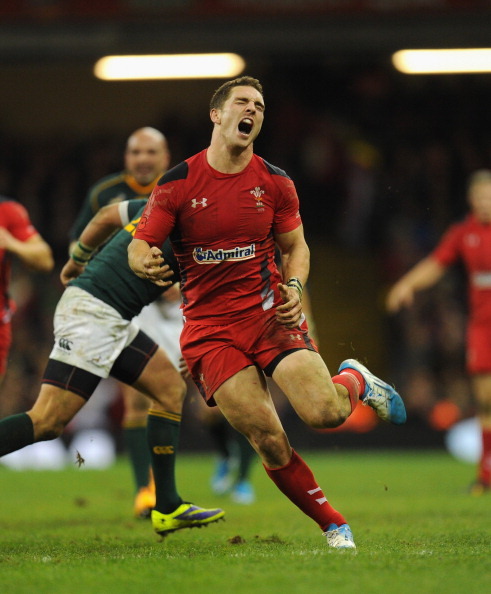 In that passage of play, Wales lost Davies and Liam Williams to injury and with it momentum and shape. When Adam Jones left the field after 30 minutes, many may have feared the worst. In truth it was a breathless and brutal first-half, Du Plessis had already powered over for a second score after 16 minutes, but Wales held firm and after 60 minutes, the boot of Leigh Halfpenny had pegged South Africa back to 17-15, as the crowd sensed a famous victory. It was then that Fourie du Preez scored the game’s defining try after a midfield scramble fell in teh Springboks favour. Wales continued to press deep into the Springbok half, earning more territory and possession, but they couldn’t convert the all important score and when referee Alain Rolland blew up, a 3-0 try-count told a familiar story. Wales, despite their bravery and brio, had failed to inflict a loss on a Southern Hemisphere opponent for a seventeenth consecutive time. Over the space of 50 minutes, after South Africa’s second-score, Wales clawed back an 11-point deficit to just two points, knowing the next score could be crucial. After a high-ball was lofted, it came off Hook’s shoulder and bounced back to South Africa, Du Preez spotted the space down the left flank and put in a teasing kick with his favourite left boot. With the help of a fortuitous bounce, Fourie, who replays show clearly offside when Du Preez kicked the ball, picked up the ball, spun cleverly and passed inside to the advancing Du Preez to gather and go in under the posts. It was a mortal blow to Wales’ chances of defeating South Africa for the first time in 14 years. At 6ft 4ins and nearly 19st Alberts is built more like a lock, but he put in an supreme 18 tackles over 65 minutes. However, it waa a few key tackles, that made all the difference to to complexion of the game. He repeatedly drove Welsh tacklers into the cut-up Millennium Stadium turf, including Wales’ twin battering rams, Richard Hibbard and Bradley Davies, leaving them battered and bruised. It was an archetypal Bok enforcer job done with a brutal edge, but Alberts also showed soft hands in midfield and hard yards at the breakdown. It was huge performance for the team. Honourable mention must go to Richard Hibbard who was magnificent for Wales.